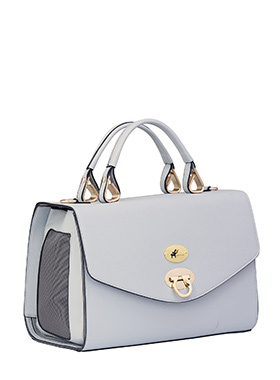 If you want a bag that does not remotely look like a pet carrier then this is the one for you. Perfect for smuggling your dog into wherever you choose, but we didn't tell you that! The Jessica Pet Carrier has a beautiful faux leather outer and there are mesh windows at each end of the bag to provide maximum ventilation and make it possible for your pet to take in the view during your outing. The entire top flips open so that your dog can be lifted in or out without any fuss. The interior has a removable quilted easy clean liner and it also has a leash clasp for extra safety. It can be carried by hand or over the shoulder using the removable shoulder strap provided.